New location improves access and coordination of care for patients with brain tumors. 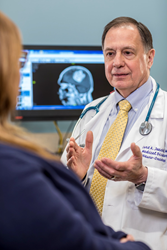 The opening of the Gerald J. Glasser Brain Tumor Center ensures patients will be surrounded by caring experts in an environment dedicated only to treating brain tumors and offers patients and their families a support system during a difficult time. Atlantic Health System today announced the opening of the Gerald J. Glasser Brain Tumor Center at Overlook Medical Center in Summit, NJ. The Center has moved to a new, larger location on the main floor of Overlook Medical Center, in a dedicated space that will better accommodate the more than one thousand patients who access the Center’s services each year. The new location further enhances the Center’s patient-centered approach to treatment and care, as well as the staff’s ability to support patients and their families while they receive treatment. For more information about the medical team, clinical trials, and treatment options, and to learn about patient stories, visit http://atlantichealth.org/braintumor. To make an appointment, or speak with someone directly, call 908-522-5914. For more information on these clinical trials or other studies, please call the Atlantic Center for Research at (973) 971-5235.